Another week, another fun-filled triad. Yes I’m being droll. 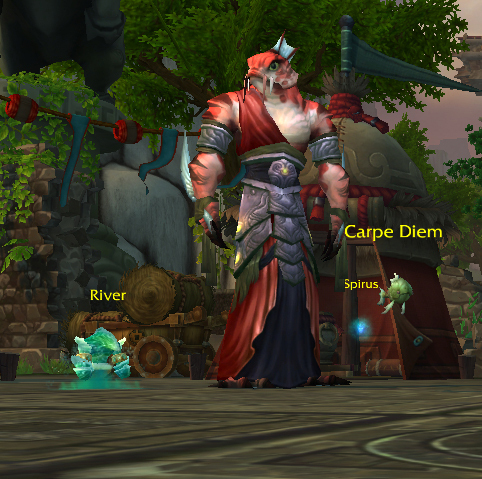 Mari has the aquatic Carpe Diem (yukyuklulz), the magic Spirus and the elemental River. There are 2 real keys to this fight. One is to have a pet with a weather ability and good offense to beat up Carpe Diem super fast, and the other is to beat up Spirus really quickly. Spirus heals and has Arcane Blast, so he’s basically a ticking timebomb you need to burst down before he gets out of control. River can be problematic because he likes to combine a whole lot of things into one big burst turn, but is easily countered for that exact reason. Carpe Diem’s first move will always be Cleansing Rain, which then leads into Dreadful Breath, a several-turn AOE which hits twice as hard while the weather is rainy, meaning that he’ll try to destroy your entire team at once. I go with my Gilnean Raven (or the Crow if you’d prefer), both because I can change the weather with Darkness and because I can wreck the silly fish’s face in like 2 turns because he’s vulnerable to Flying. Just make sure that if you’re faster than the fish, you use your regular attack the first round. You don’t want to waste your weather. The carp’s third ability is Grasp, but if you go with the previously cited weather bird of doom, you’ll wreck his face before he casts it. And if you go with a different pet, it’s Grasp. Shrug. The second pet Spirus uses primarily magic with Arcane Blast though, so your raven is going down. Make sure to cast Darkness again asap, as Spirus also has a fairly large heal. I ended up picking a Mechanical Dragonling for the second pet, because mechanicals defend strongly against magic damage, and the Mech Dragon has a dragon ability which is strong against the Magic pet. Also, Decoy helps a lot against the arcane blast onslaught. I’ve used regular dragons here too, and they’re alright, but the defense you get with the Mechanical Dragon really helps. You may want to avoid using big attacks though, both because of the Magic family damage per hit cap, and because Spirus also uses Soul Ward. Now you’re probably saying, well then, if the last pet is elemental, the Mechanical Dragon’s gonna get wrecked too. Oddly, River has all aquatic abilities. I can usually get River down about halfway with the dragon. After that, because of River’s tendancy toward single-turn burst with Dive and Whirlpool, not to mention Pump, I like a mongoose or otter, something like that. I can dive to avoid and Survival if things get super dire. I’ve tried a snail here, but this is a little less reliable. If a snail’s Dive hits you’ll win and if not, you start over. A strider can work due to sheer burst, but I found it a lot more reliable to just use the mongoose. But, you may want to save your strider for Blingtron 4000! The first pet you go up against, Au, is an elemental, and I had great success beating him with a water skimmer. 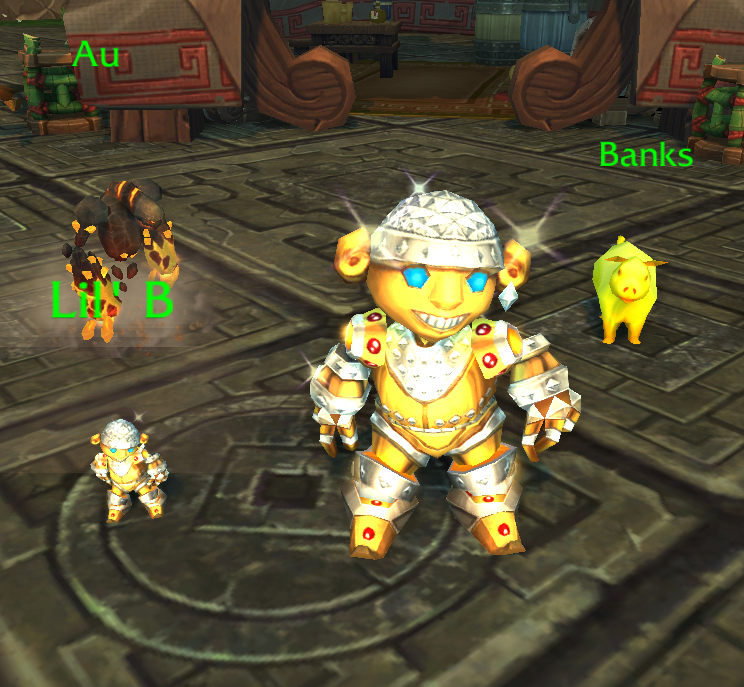 The other 2 pets are Banks, a critter, and Lil B, a mechanical. Au is relatively easy once you figure out his pattern. He has a new ability called Goldskin, which he can use every other round, which hits you and makes it so the damage he takes is reduced by 100. So, because you’re likely going to be faster, using the water skimmer, I use a simple nuke the first round. Then he’ll have the Goldskin, buff up, so I cast Pump for the first time on the 2nd turn while he hits me with his Gilded Fist, which is a new simple humanoid attack. 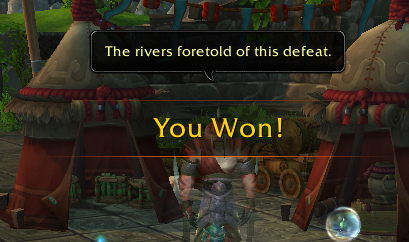 Then, after his Goldskin runs out, I cast Pump again. He should die. If Pump misses, I take the next turn to heal up, and then cast the regular nuke again. You’ll likely want to follow that pattern regardless, using your damage abilities and buff or healing abilities on alternating turns. His other ability is Gold Rush, which is a renamed Stone Rush. The next pet, Banks, is a gold piggy. He has a mechanical DoT as pretty much his only offense, so you may want to be on the lookout for a pet that has beast attacks in a non-beast pet (eg, Lil Bad Wolf). 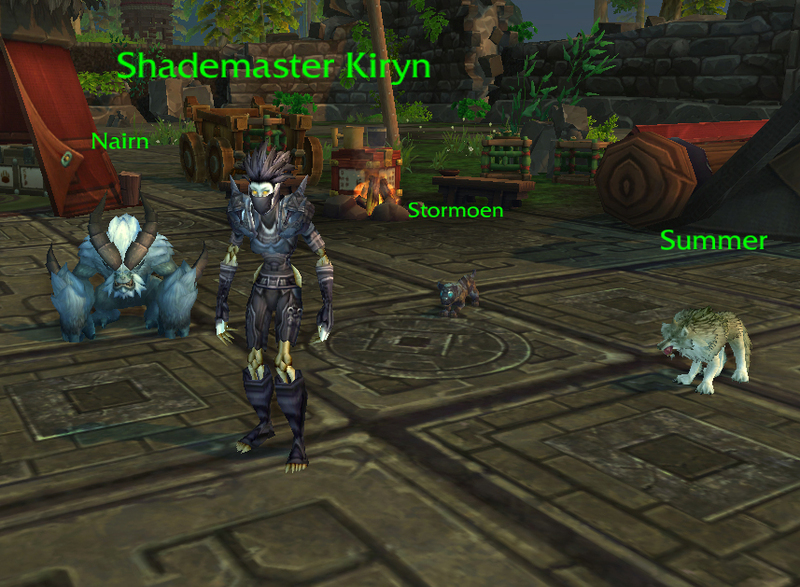 Since the Panther Cub (or another cat) was key in last week’s triad, I decided to use him again here. The DoT does hurt, but this should be another 2-shot fight. His other 2 abilities are a heal, and Uncanny Luck. I also had good luck using a crab here, especially with Shell Shield, but because of the heals this leg of the fight took a super long time with the crab. The Panther got completely wrecked by the next pet, Lil B. The crab or a crawdad isn’t a much better pick though, because Lil B also has Blingtron Gift Package, which heals him on a relatively long cooldown. He also has Extra Plating, and an ability called SMACKTHAT.EXE, which functions similarly to Batter, only has a very different animation associated with it. Lil B is faster than almost all rare pets at 358 speed so he’ll almost always get in that extra hit. My pick here is the Pandaren Earth Spirit, because his stun helps to extend the time between Extra Platings, allowing you to pump out more DPS. Another valid strategy is a pet like Fel Flame, with Conflag, using the Conflag the first turn Extra Plating is off cooldown. Almost any elemental with good burst will probably be able to win here. The key is to manage that Extra Plating downtime. Remember too, that he’s a mechanical, so he’s coming back after you beat him at least once! Kiryn’s whole team is a nod to Game of Thrones. There’s the humanoid Nairn, the mechanical Stormoen, and Summer, the erstwhile direwolf. Nairn’s 3 abilities are the slight damage AOE weather effect Call of Winter, Nairn!, which is a critter damage ability with a self-buff component, and Giant’s Blood, which damages you and heals him. Because of the critter bit in Nairn!, his main attack, I went with a Lesser Voidcaller here and just attacked him down. Once I got around that critter damage it wasn’t no thang. The Curse of Doom in particular helps, a lot. Stormoen cracked me up, because this is the Thunderstorm PVP strat I used to really enjoy in one silly little mechanical cat. Her 3 abilities are Build Turret, Call Lightning and Batter. Because I used to play this, I know really well how to counter it. Any kind of shield and you’ll be absorbing just about all of the damage Stormoen can dish out. For PTR, the first elemental pet I saw in my list with some kind of damage shield was the Living Sandling, with Stoneskin but I believe there are others. Oddly, my elemental pets were taking the extra hits from the Lightning, so this isn’t just to make all Stormoen’s native offense moot. A self-only shield is preferable to just changing the weather, because Stormoen takes the extra damage from Lightning too, but a weather change would work too. Summer is rather tricky. She uses Prowl, Dodge and Bite. I found a Darkmoon Zeppelin to be absolutely key here, just because it’s one of the few mechanical pets with a straightup avoid with Decoy. Otherwise, the Prowl/Bite combo can pretty much one-shot you. I’ve also noticed that she likes to use Dodge, then Prowl, so it’s difficult to even interrupt her. But, because of the way the Zeppelin’s barrier works, you can still dodge it no problem. Leveling Worksheet (italics means they’re used in a different triad, updated as strategies progress): Gilnean Raven or Crow, Mechanical Pandaren Dragonling (or a rare dragon with avoidance), a mongoose or otter-type aquatic pet, Lesser Voidcaller, elemental with a damage shield, Darkmoon Zeppelin, water strider, a beast damage pet (preferably a Prowl or other combo pet), a pet with elemental burst. This entry was posted in strategy and tagged 5.4, celestial tournament, strategy on August 19, 2013 by Liopleurodon. Moth is great as you can Cocoon the Prowl/Bite. KLR > Critters on Bling.